Protest in London by activist group Sisters Uncut. Photo: Sisters Uncut. 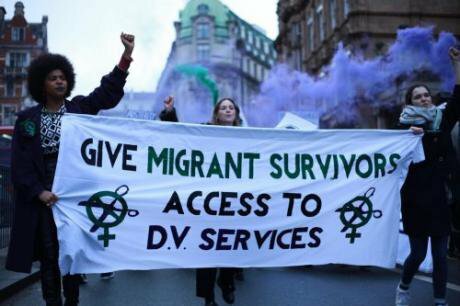 On December 15th of last year the Women Against Violence Europe (WAVE) network and the Platform for International Cooperation on Undocumented Migrants (PICUM) launched a joint campaign calling for access to services for all women who are survivors of violence in Europe, regardless of migration status. This initiative featured a pledge supporting the core principles that women’s rights are human rights and that we must stand in solidarity against discrimination. It is part of WAVE’s Europe-wide Step Up! campaign (2016-2017) to increase action to tackle violence against women. This joint initiative is necessary because across Europe, there are survivors of violence who do not have access to support services because of their migration status. Women who are undocumented or have irregular status may risk detention or deportation when approaching services or reporting violence to the police. PICUM advocates for the implementation of a ‘firewall’ between the provision of basic services and immigration control – survivors of violence should be able to report this crime and have access to protection without fear of detention or deportation. Women exposed to violence who are undocumented or have insecure immigration status (i.e no permanent residency or citizenship) are often turned away even from specialist support services such as shelters, for example due to exclusionary funding systems. If shelters are state-funded and women are not eligible for state funding due to their migration status, the shelter may have no way of funding their stay. There are international conventions and European Union directives that require states to develop measures to protect and support all women survivors of violence on their territory, regardless of migration status: the UN Convention on the Elimination of All Forms of Discrimination against Women (CEDAW), the Council of Europe Convention on preventing and combating violence against women and domestic violence (the ‘Istanbul Convention’) and the EU Directive establishing minimum standards on the rights, support and protection of victims of crime (the ‘Victims’ Directive’). The WAVE Step Up! campaign calls on states to fulfil their obligations under these legal frameworks. In my PhD research about women with insecure status in the UK and Sweden who have experienced domestic violence I found that despite the universal promise of human rights, in reality there are very different rights for people of different migration/citizenship status. In the UK, the no recourse to public funding requirement (NRPF) attached to people who do not have permanent residency means that women in this category who have experienced violence are not eligible for safe accommodation in shelters or other support services to enable them to leave abusive homes. In Sweden, most women have access to services because the right to social protection is based on residence in a municipality, but undocumented women are excluded as they are not considered legal residents. Nisan*, a Turkish woman, had been living in Sweden for 15 years when I met her. When she was a teenager and still living in Turkey she was kidnapped and raped by her then boyfriend and his friends. Her father’s abuse, which had started in early childhood, also escalated. Her brother was living in Sweden at that time and he arranged a visit visa for Nisan. As her family did not renew her visa after the three-month validity period ended and she was afraid of returning home to Turkey, she continued living in Sweden undocumented. When she had been in Sweden for a few years, Nisan’s uncle advised her to tell her story to the police and apply for residency. Nisan did so, but did not get an answer about her status until she was 20, at which point she was refused. Her only options were either to go back to Turkey or wait for four years and apply again. She waited for four years, without papers. When she applied for residency again she had new evidence to present from the police and hospital back in Turkey about the violence she had suffered. However, the migration board again refused to grant her a residence permit because they did not believe it could be true that she had been in Sweden for ten years without documents. They told Nisan, “‘you are lying, you haven’t been here for ten years, there’s nothing proving that… according to the law, you are not here’”. Nisan’s family then encouraged her to marry a man she had been seeing who was a Swedish citizen and she eventually got permanent residency on the basis of this marriage. However, the relationship became abusive. Nisan explained, ‘He was sick in the head he would threaten me and do all this sick stuff and we weren’t even married anymore’. Nisan’s ex-husband raped her and she went to hospital where she was encouraged to go to a women’s shelter and there she finally escaped the cycles of violence she had experienced since childhood. Nisan was able to access a shelter because she now had permanent residency and thus was considered legally resident. At the time of the interview she was waiting for a decision on her citizenship application. From the perspective of having moved through a number of migrant categories, from undocumented to asylum-seeker, back to undocumented, to spousal visa holder to permanent residence, and now waiting for citizenship, Nisan talked about ‘degrees’ of rights for different categories of people: ‘It’s like degrees, if you are paperless you don’t have any right to get anything. If you are asylum seeker you would get a little help but not that much either because they are not sure which city you’ll stay in. If you have permanent residency, you can get more help, but it takes a lot of time. Nisan’s experiences highlight the fluidity of migration categories. The labels of ‘temporary visitor’, ‘undocumented migrant’, ‘asylum-seeker’, ‘failed asylum-seeker’, ‘spousal visa holder’ and ‘permanent resident’ could all be used to describe Nisan’s status at different points during her life in Sweden. These categories do not adequately reflect the experiential aspect of Nisan’s precarious journey to permanent residence. Fixed labels conceal the complexity of lived experience and the reasons for entering and moving out of different migration statuses. In public and political discourse migrants are often described as belonging to one migrant group or label - the empirical fluidity of migration categories, and the potential that the same person could move through several, even six, labels as Nisan did, is not part of policy discussions. Basing rights on immigration status is thus problematic partly because this approach assumes that this status is ‘static’, and also that it is ‘deserved’. For instance, curtailing the rights of undocumented migrants may be based on an assumption that these individuals have deliberately defied the legal system and thus made a conscious choice to step outside of the status of a rights-bearing subject. In reality, a survivor of domestic violence may, as part of the abuse, not be in control of her travel documents and may become an ‘overstayer’, and thus, ‘irregular’ if the perpetrator refuses to renew her visa. Seven of the 31 survivors I interviewed told me they were undocumented or ‘overstayers’ at some point during their stay in England or Sweden. In the context of the refugee/migration ‘crisis’ in the EU since 2015, the terminology of migration has been given increased attention. The correct usage of terms such as ‘asylum-seeker’ versus ‘economic migrant’, and using ‘undocumented/irregular’ instead of ‘illegal’ is becoming more commonplace in public discourse. What is not often discussed is the validity and adequacy of the categories these labels signify. If women move through different migration categories and at times this movement is forced upon them by perpetrators of violence, these categories cannot be used as the basis for assessing eligibility for basic rights. The basis for determining rights should not be citizenship, legal residency, or even a temporary visa. The basis for the right to live free from violence should be presence.